they become no better than beasts. He was son of Ogoun, orisha of metals, lord of tools and agriculture, hunting and war weapons. Those who sow, prune. Those who search, hunt. Eye to eye, tooth for tooth. He was a double-edged sword, sharp, forged with mallet. But he knew that to put iron to iron would be to challenge Ogoun and that things could only end as they did. A handsome man, he had the sort of intense gaze that engulfs whomever it falls upon. Around his neck a charm necklace he was gifted when still a child. His dad tied a figa amulet to it, right by the boy's throat. As the boy grew his mother lengthened the lanyard. A strong spell. A good boy, he didn't get into trouble, he was docile and focused. But at around the age of 10 he turned into a different person. He no longer got along with girls or other boys and he turned silent. He would spend time alone, frowning, lost in thought, thoughts swept by the wind without anyone having a chance to collect them. His mother worried at every dawn. Go and play, boy! And if the night was silent she tried to shush her heart. A mom will be a mom, escaping but always feeling. And praying. She prayed quietly, "Oh, Lord!" He was growing up. He would stare with a shifty, evasive, discreet eye, but his body was impervious, trim, tasty. One day he caught himself looking at the men by the dock. He had urges. He prowled and prowled. He was like a caged beast, though more akin to a lion thrown into David's den. But he no longer believed that divine providence fed him. He was a man and he desired a man. So it was written. Fate. He fulfilled his destiny on a night of full moon and high tide. The moon in the sky was neat as in a child's drawing. The sea foamed, the wind blew. The waves raced to his feet, purifying, cleansing whatever was in the way. They stirred the sand and left the earth light and pure. He saw a luminous streak on the other's skin, in the laughter of the intimate stranger, in the eye that shone in his. Accomplice. And the young man discovered a howl in the silent night. He had found his place. But this type of love is doomed to burn in a silent fire. It must fight, with cloak and sword, an unfair fight against a dragon. A divination not divine but human. Prediction: it will perpetually and repeatedly be turned into empty pumpwood ember, burning swiftly. Soft wood that warps, no arrow wood - nor beam. A tree with skimpy canopy that provides no shade. And so the fellow carried on in the burning hot sun, from sun to sun. And so, as in a witch's tale, calm and peace began to end. * And silence began turning into screams, wails from that man who now had a voice and spoke of him, shouting what he didn't want to hear. He withdrew to a corner in surrender but the light-skinned man stood above him, shining in the moonlight, yelling things he never wanted to know. He began being sure of the sorts of things we know are not, the sorts of blurry things that spit fire and eat anger. Then, fury screamed: "I am Son of Ogoun! Black god of war. And son of Saint George! Son of Orisha with dagger and spear. Forge your weapons, Ogoun! This is war." And that is how a love that nobody saw and nobody heard ended. The white man's dark blood flowed onto the pale sand and the low tide washed away nothing. NINA MANIÇOBA has her roots in the Pajeú River in the State of Pernambuco. She is a daughter of the forest living in São Paulo, but she has the northeast of Brazil tattooed in her dreams. She believes in the power of debate and ingenuity. She is a doctor, graduated from the Federal University of Pernambuco, and completed her residency as an OBGYN. 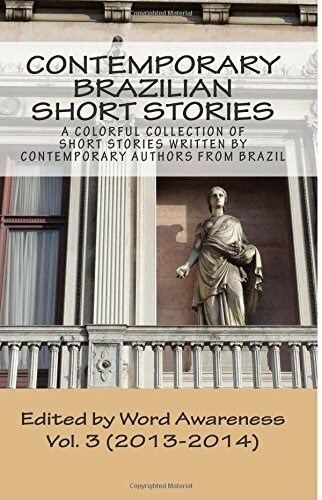 Nina is also a specialist in Literature, with a degree from the Pontifical Catholity University in São Paulo and had a short story published in 2012, entitled Boi sem asas [Bull Without Wings]. She also co-authored two books: A medida de todas as coisas [The Measure of All Things] in 2011 and Partidas [Departures] in 2014. She participated in several literary events as an author, including FLIV (2011), Balada Literária (2011 and 2012) and OffFLIP (2014). She is the founder and organizer of Movimento Cultural de Floresta [Cultural Movement in the Woods], an annual event that features talks, concerts, contests, dance presentations, music, painting, and awards to individuals, schools, teachers, and students.